Security double glazed entrance door to front, coved ceiling, plastered walls, carpeted, wooden staircase leads to first floor with large double glazed window to side, understairs storage area, radiator, telephone point, power point. Double glazed window to side, coved ceiling, smooth plastered and part-tiled walls, two piece suite comprises low level wc, pedestal wash hand basin, tiled flooring. 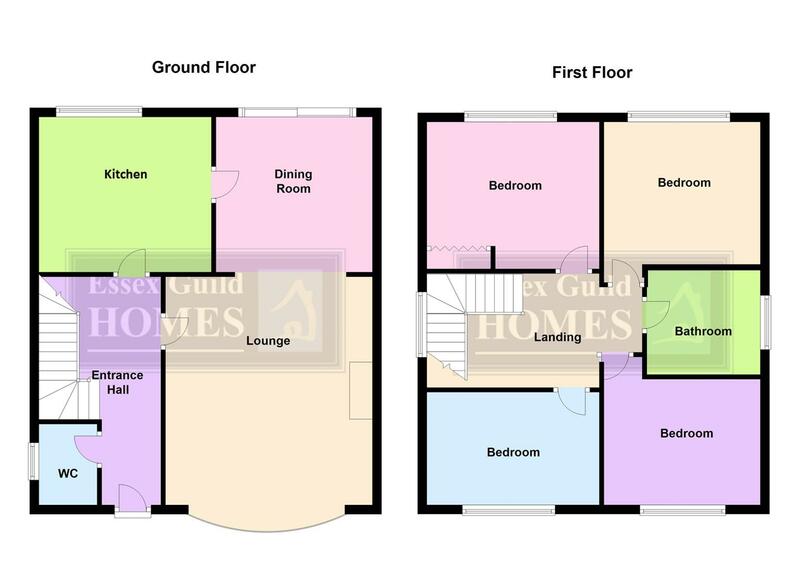 Double glazed windows to front aspect, smooth plastered ceiling with inset lights, smooth plastered walls, recessed area for large television with recess shelving below, neutral coloured carpet, designer vertical radiator, arch to dining room. Double glazed double opening doors with matching side panels to rear garden, coved ceiling, plastered walls, carpeted, various power points, radiator. Double glazed windows and door to rear, smooth plastered and coved ceiling, part-plastered and part-tiled walls, range of fitted natural wood units at both base and eye level, four ring hob with feature extractor fan above, fitted double oven, space and plumbing for washing machine and dishwasher, space for Amercian style fridge/freezer, vinyl floor tiles, double radiator, various power points. Textured and coved ceiling, plastered walls, loft access, carpeted. Double glazed window overlooking rear garden, textured and coved ceiling, plastered walls, carpeted, built-in wardrobes, radiator, various power points, television point. White double glazed window to front, smooth plastered and coved ceiling, smooth plastered walls, some feature decorative paper, carpeted, various power points, television point. White double glazed window to rear, smooth plastered and coved ceiling, plastered walls, carpeted, radiator, television point, built-in wardrobes. Double glazed window to front, smooth plastered and coved ceiling, smooth plastered walls painted in neutral colours, radiator, various power points, carpeted. White double glazed window to side, textured and coved ceiling, smooth plastered walls part-tiled at lower level, four piece suite comprises low-level wc, pedestal wash hand basin, chrome mixer taps, panel bath with mixer tap and shower attachment, separate tiled shower cubicle with glazed entry door and matching side panel, inset chrome shower, heated chrome towel radiator, vinyl floor tiles. Commences with patio area, then mainly laid to lawn with well established bushes shrubs and trees, panel fencing at sides, hardstanding with shed at rear, gate at side to car port. Covered parking area for two to three vehicles leading to detached garage. Up and over door to front, door and window to side, power and lighting connected. Further hardstanding to in total allow parking for approximately four to five vehicles, mostly laid to lawn, slate beds, established bushes and trees, rockery, small pond area, open aspect to green to front.